Nothing but Human: On "The Right to Have Rights"
In this excerpt from the introduction to The Right to Have Rights, Stephanie DeGooyer charts the paths taken by Hannah Arendt's phrase. 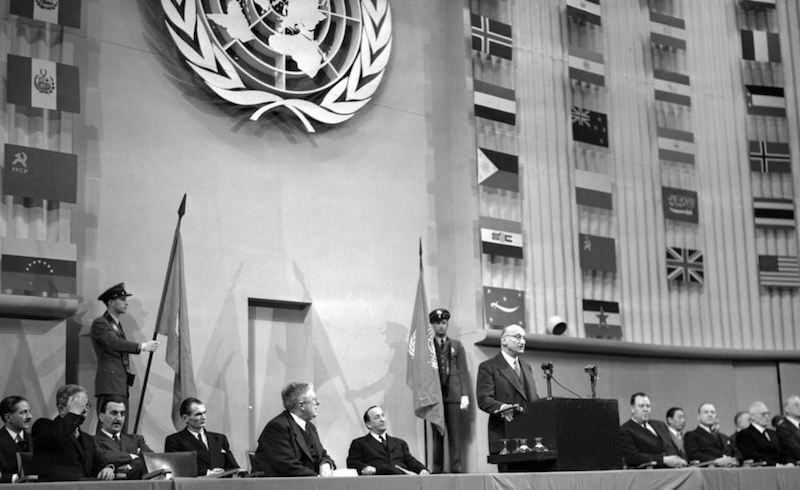 The Third Committee of the UN Assembly, which would adopt the the Universal Declaration of Human Rights in December 1948. Excerpted from the introduction to The Right to Have Rights. The decisive factor is that these rights and the human dignity they bestow should remain valid and real if only a single human being existed on earth; they are independent of human plurality and should remain valid even if a human being is expelled from the human community. Indeed, the three historical statements of human rights — the Declaration of Independence (1776), the Declaration of the Rights of Man and of the Citizen (1789), and the Universal Declaration of Human Rights (1948) — all boldly assert these rights to be “inalienable.” When all else is lost, human rights are what humans fall back on as a natural birthright. If humanity is a mark of vulnerability rather than a source of protection, citizenship comes into view for Arendt as the right that can enable the exercise of so-called human rights. In theory, of course, it was supposed to work the other way around. In the late eighteenth century, the newly founded American and French republics drew their legitimacy from their ability to ensure the protection of the natural rights that human beings already possessed. Nation-state citizenship was in some sense merely the concrete realization of these abstract rights. In practice, however, as Arendt points out, it turned out that the opposite was the case. The so-called Rights of Man could be enjoyed only as the rights of citizens. No one better understood this crux than minority and stateless persons in the twentieth century. The more these groups were rendered merely human by denationalization practices, the more they insisted on their nationality and the more urgently they claimed reintegration into a national community — despite the work of international organizations, to no avail. We became aware of the existence of a right to have rights (and that means to live in a framework where one is judged according to actions and opinions) and a right to belong to some kind of organized community, only when there suddenly emerged millions of people who had lost and could not regain these rights because of the new global political situation. The supreme importance of this right makes Arendt’s refusal to draw any special attention to it all the more conspicuous. “The banality of evil,” the phrase for which she is most well known, played a starring role in her 1963 book Eichmann in Jerusalem: it appears both in the book’s subtitle and in rare italics at the end of the last sentence of the last chapter. But in Origins, the “right to have rights” is offered almost as a throw-away expres- sion. The phrase appears just once, as one way, among several others, to describe the kind of right that those without citizenship sorely lack but desperately need. Even though Arendt added a second use of the phrase, this time with the definite article (“the right to have rights”) to the revised edition of Origins in 1958, the phrase receives no preferential treatment and is not at all the climax to the chapter. Rather, in the six pages following the introduc- tion of the “right to have rights,” the chapter continues to explore the predicament of rightlessness in preparation for the third part of Origins on full-blown totalitarian movements. The “right to have rights” flared up briefly in Arendt’s thinking. It was not meant to be a watershed moment. After it had been invented by Arendt, the “right to have rights” would wait some fifty years before garnering interest from scholars, activists, and the general public. In fact, it was largely ignored for decades after it was articulated. Although The Origins of Totalitarianism was quickly heralded as an important book written by a brilliant new political theorist, none of its first reviewers mentioned the “right to have rights” or the chapter in which it appears. Compared to the heated, even scandalous, public controversy that surrounded the “banality of evil,” the “right to have rights” was hardly noticed by anyone. Arendt herself paid the phrase no attention. She does not mention it in subsequent writings, even when the topic at hand, such as rights, statelessness, violence, or civil disobedience, would seem to invite its reprise. When the “right to have rights” was first welcomed into the world in the late 1950s, nearly a decade after its invention, it was at the cost of being treated as a foundling. In two opinions written in 1958, US Supreme Court Chief Justice Earl Warren invoked the phrase to oppose the US government’s legal ability to strip citizens of their nationality. “Citizenship,” he wrote in a dissenting opinion in Perez v. Brownell, “is man’s basic right, for it is nothing less than the right to have rights.” It is clear from court records that Warren borrowed the expression from Arendt. (During their deliberation the Supreme Court Justices consulted a lower court’s opinion on the case, which itself cited an article in an issue of the Yale Law Journal from 1955. This article quotes from Origins the phrase the “right to have rights.”) However, Warren did not acknowledge his citation in either of his opinions. As a consequence, the “right to have rights” was, until quite recently, widely believed to originate with him. Indeed, a quick Google search reveals that most usages of the phrase until 2000 identify its author as Chief Justice Warren. Specific statements aside, [the American Declaration of Independence and the French Declaration of the Rights of Man and Citizen] granted the recognition of the right to have rights (the expression is borrowed from Hannah Arendt although she uses it in a rather different sense), and thus gave rise to an adventure whose outcome is unpredictable. Not only does he fail to mention the book from which he quotes Arendt, he folds the phrase into his own argu- ment about human rights, sidestepping the argument that led Arendt to introduce it. All of this, moreover, occurs parenthetically. Unsurprisingly, Lefort’s essay, as influential as it has been, hardly encouraged interest in Arendt’s invocation of the “right to have rights.” This is especially ironic since something like “his” reading of the right to have rights is already legible in Origins. While activists have mainly treated the “right to have rights” as an uncomplicated synonym for human rights, a more nuanced interpretation has emerged among scholars. The initial scholarly take-up of the phrase came from political theory, though interest soon spread to researchers from fields as diverse as sociology, literary studies, political science, and jurisprudence. Turkish-American political theorist Seyla Benhabib was one of the earliest scholars to draw attention to the phrase. Her lucid interpretation, first stated in The Reluctant Modernism of Hannah Arendt (1996) and subsequently elaborated in various books and articles, has become the most widely influential. One of Benhabib’s principal concerns with the “right to have rights” — as Stephanie DeGooyer discusses in the first chapter of this book — is its foundation. As has been explained, the phrase was born out of the realization that in order to have rights, it seems that one must first have a right to be a member of a political community. And yet in calling it the “right to have rights,” Arendt highlights a potential contradiction. For how can a person who does not belong to a polity assert a right to belong to one when the condition of asserting rights is belonging to a polity? Benhabib’s explanation is that the repetition of the word “right(s)” masks the fact that the singular “right” and the plural “rights” belong to different orders of existence: the first “right” is a moral entitlement possessed by all individuals, while the second “rights” refers to legal entitlements possessed only by citizens. Even as this interpretation avoids letting the phrase founder on a contradiction, for Benhabib it raises the pressing question of the foundation for the first, moral right. She acknowledges that Arendt does not specify the ground on which the normative claim to belong to a community rests. By withholding this ground, she argues, Arendt “leaves us with disquiet about the normative foundations” of the right to have rights. Insisting that the only way to resolve this problem is to “leave behind the pieties of textual analysis,” Benhabib posits that the “right to have rights” is premised on a Kantian conception of each human being as a free, rational agent and, hence, an end in itself. It is a right that each and every human being has simply by being “a member of the human species.” In other words, the “right to have rights” is Arendt’s version of the traditional conception of human rights. Arendt herself, as we note above, expressed grave concerns about whether being human was, in practice, enough to enable anyone to enjoy rights without also being a citizen of a nation-state. According to Benhabib, however, Arendt is too hasty in concluding that only citizenship in a nation-state can reliably guarantee rights to individuals. Changes in international law and politics since the publication of Origins, she contends, have created a forum above the level of the nation-state in which the rights of human beings who are not citizens can be asserted and enforced with increasing effectiveness. Principal among these developments are the Universal Declaration of Human Rights (1948), the Convention Relating to the Status of Refugees (1951), the International Covenant on Civil and Political Rights and the International Covenant on Economic, Social and Cultural Rights (both 1976), as well as the institutions of compliance and monitoring that accompanied them, such as the United Nations High Commissioner on Human Rights and on Refugees and the European Court of Human Rights.